Eating with the Americans: The Personal Is Political – What is American Food? The essential elements of American eating are hard to pin down. “What is American food?” is a loaded question that ultimately stems from a larger query: “What is American culture?” Is it progressive or conservative; white or black; native-born or immigrant; founded on absolute liberty or social safeguards? The conflicting and intersecting identities of people living in America make these dichotomies impossible to resolve in absolute terms; like it or not, American culture is all of these things, regardless of whether one faction or another believes it should be. This acknowledgement of America’s contradictory, tenuously coexisting values, however, does not simplify but rather complicates the matter of “American food.” Tying American food to any particular group or cuisine makes a bold assertion about what one considers the truest, purest, and most wholly American way of being, rejecting the notion of a complex and heterogeneous culture. As the collective Pinterest posts of this class demonstrate, American food is characterized by luxury and affordability, mass-production and lovingly handcrafted artisanship, excess and restraint, tradition and innovation. What, then, is the unifying factor in this smorgasbord of ideology? I would posit that ideology itself is the common denominator. With American food, to borrow a phrase from feminist activists of the 1960s, “the personal is political;” everyday choices carry symbolic and psychological weight, and formalized political action (e.g. goal-oriented protest) is not the only legitimate platform for change. That is to say that the policies, economies, and choices surrounding American eating habits are heavily influenced, on both an individual and collective scale, by underlying sociopolitical structures and their historical antecedents—and conversely, American attitudes toward food play a crucial role in the continuous construction of the country’s policy, philosophy, and social identity. Ultimately, the use of food to both perform and promote cultural and political values is more universal to the American food experience than any one particular way of eating; food in America is, at its core, both an object and a vehicle of political expression. Many people would attempt to dismiss the politicization of everyday foods as just another consequence of liberal academia’s penchant for over-analysis. However, this short-sighted perspective gives little credit to the social consciousness of the general public. For instance, in Kathleen LeBesco’s article “There’s Always Room for Resistance: Jello, Gender, and Social Class,” interviews with multiple women reveal a distinct sociopolitical awareness in their personal associations and memories of this seemingly innocuous product. One subject describes feeling “like I was reliving my mother’s life: being the perfect woman, Jell-O molds and all;” another perspicaciously observes, “When I think of Jell-O I think of trailer parks and pink flamingos on the lawn, though I’m sure it’s the solid middle class that’s eating it. It has this connotation of being cheesy…it’s cool because mainstream people think it’s not”. [i] LeBesco’s 20-page social history of Jell-O is informed by extensive research and a thorough dissection of white suburban gender and class dynamics, but the casual impressions of her interviewees are insightful in their own right, investigating the roots of stereotypes, reflecting on social dynamics of the past and present, and making a personal decision to uphold, reject, or reshape the identities Jell-O has come to represent. Ultimately, even if they lack the academic vocabulary or analytical background to fully deconstruct the implications of their cultural observations, Americans (and non-Americans living in American society) interact constantly—both consciously and subconsciously—with the politics and history of their lived experiences. And what lived experience is more universal, more fundamental to human culture, and more heavily imbued with social value than the consumption of food? When transplanted into the American social framework, even foods that are distinctly non-American in origin take on new significance as markers of identity; dishes that were once a banal, quotidian staple become an object onto which to project cultural values, a defensive point of ethnic pride and proprietorship. Contemporary debates over the appropriation of non-Western cuisines and the ethics of culinary fusion draw on age-old tensions of racism and imperialism, particularly regarding the position of immigrants and people of color in American society. In one striking example, recent complaints over bastardized bánh mì at Oberlin College centered on the perceived cultural insensitivity of the dining hall’s loose interpretation of what one Vietnamese student termed “traditional food”—despite the sandwich’s history as a much-mutated product of French colonialism. [ii] Though the students’ train of reasoning was perhaps incomplete, the chronological technicalities were not really the point: their intended political statement, which successfully elicited change at Oberlin and sparked a national conversation, merely used food as a jumping-off point. Within the context of America’s fraught racial values, the more recent transgression eclipses the offense of bánh mì’s imperialist origins; inauthentic bánh mì becomes a stand-in for the marginalization and misrepresentation of Asian-Americans in mainstream culture, a rallying point for the airing of broader cultural grievances. America’s obsession with nutrition, calorie-counting, and dietary fads like “clean eating” are not purely dependent on objective scientific findings, however much we might like to believe otherwise. The direction and conclusions of scientific research have historically been influenced by social values of the period, and nutrition science is no exception. In the early twentieth century, Progressive-Era social reformers took a paternalistic view of the working classes, asserting moral superiority over the poor and connecting bad habits with bad character. The puritanical values of discipline, restraint, and self-denial still formed the prevailing morality of American society; early attempts to quantify the elements of a healthy diet often reflected this morality in their cautions against eating for pleasure. Though these ideas are less codified in the 21st century, their legacy still has a subtle influence on modern dietary advice. Americans routinely stereotype overweight people as lazy and unintelligent, with poor impulse control, despite the complexity of factors that contribute to obesity—not to mention the politicization of obesity itself as a public-health crisis. Proponents of various elite diet trends, ranging from veganism and paleo to a vague commitment to “eat clean,” often rely on the premise that prepared or processed foods (and by extension, the people who eat them) are lesser; thus even the most seemingly banal convenience foods are corralled into arenas of class confrontation. The ascription of gender norms to different modes of behavior also extends into the realm of food: substanceless salads, an obsession with effortless thinness, and a rhetoric of “indulgence” continually tell women to eat less, do less, be less. The American Everyman, on the other hand, drinks beer and eats as much red meat as he wants—necessary, of course, to support his role as breadwinner and archetype of masculinity. These ideals, and the dual mechanisms of shame and aspiration that keep them alive, are so entrenched in American society as to be almost invisible. But they are present nonetheless, exerting a profound influence on the choices we make and our judgments of others’ choices, both within and beyond the realm of food. In an age and a country of seemingly endless options, our food choices are not a product of chance; they are a result of our cultural values and the historical context that has created our culinary spaces, from the Michelin-starred restaurant to the farmers’ market to the gas station minimart. We internalize the cultural and political messages around us, from gender roles to racial tensions to public health campaigns, and externalize them again, broadcasting and reinforcing our values through imaginative variations on the most fundamental building block of human subsistence. The entire American social order —its jealous group allegiances and its eager cultural exchange, its dueling preoccupations with convenience and quality, progress and tradition, the high- and low-brow— is fueled, quite literally, by the collection of rituals, trends, government initiatives, and consumer choices that coalesce to form its cuisine, making food a remarkably influential canvas onto which to project a political agenda. [i] Kathleen LeBesco, “There’s Always Room for Resistance: Jell-O, Gender, and Social Class” in Cooking Lessons: The Politics of Gender and Food, ed. Sherrie Inness (Lanham: Rowman and Littlefield, 2001), 133, 146. [ii] Conor Friedersdorf, “A Food Fight at Oberlin College,” The Atlantic, December 21, 2015, https://www.theatlantic.com/politics/archive/2015/12/the-food-fight-at-oberlin-college/421401/. 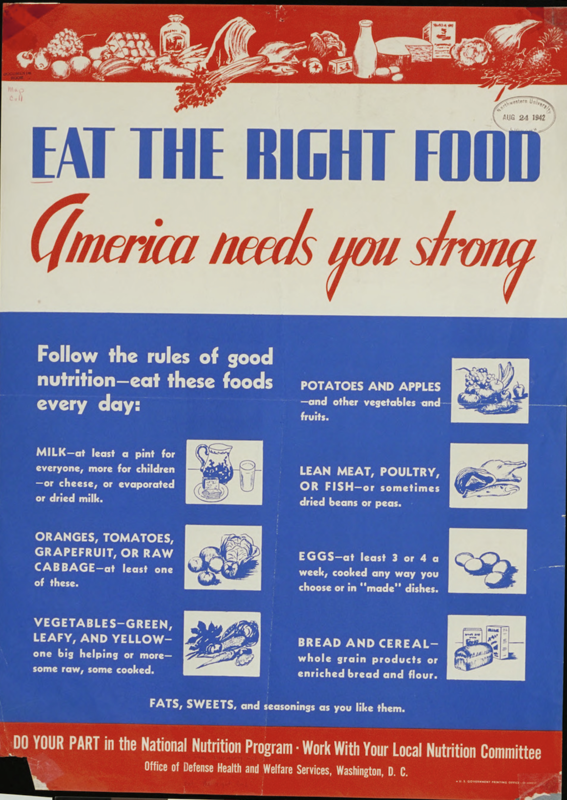 Image credit: Northwestern University, “Eat the right food: America needs you strong,” https://images.northwestern.edu/multiresimages/inu:dil-f1ed7123-b9ee-4150-b777-520eb03191cb.